Park Ridge endodontics is the specialty that treats problems within the tooth. The best-known example of an endodontic procedure is the root canal, which is done to save a tooth damaged by severe decay, a bacterial infection, or some other problem. During the root canal, the dentist will remove the diseased or infected pulp. After disinfecting the inside of the tooth, they will fill it with gutta-percha, a material that resembles rubber. 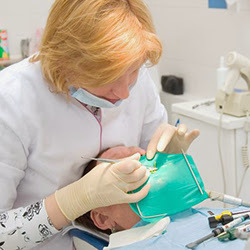 They will then cap the tooth with a filling or crown to strengthen and protect it. Other endodontic procedures include microsurgery on the roots of the tooth and various tests and exams to determine the cause of a toothache, particularly if the pain is intermittent or seems to involve more than one tooth. Periodontics is concerned with the treatment of periodontal or gum disease, which is a bacterial infection that affects the gums and can also affect the jawbone. Untreated gum disease can eventually cause tooth loss. The word “orthodontics” comes from the Greek words for “straight” and “tooth.” It is thus concerned with straightening teeth and correcting malocclusions or bad bites. To this end, Awesome Dentistry offers several types of braces. While the metal braces are still the most common and popular type, they are smaller and less obtrusive than the “railroad tracks” of yore. Self-ligating braces are a variation of metal braces that eliminate the need for elastics, and Invisalign is both transparent and removable. The last is a set of aligners that fit snugly over the patient’s teeth and gradually nudge them into their correct positions. To learn more about Park Ridge endodontics and other services, contact Awesome Dentistry.